Ira Lehn has a Bachelor of Music, Master of Music and Performer’s Certificate from the Eastman School of Music. 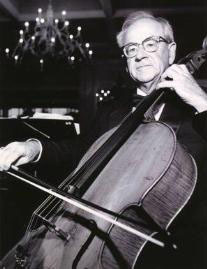 Ira has served as assistant principal ‘cellist of the Rochester Philharmonic, principal ‘cellist in the Tulsa Philharmonic, Ventura, Santa Barbara, Modesto and Stockton Symphonies and as ‘cellist in the Alard and Sierra Quartets. As a soloist, he has appeared with numerous orchestras, including the Philadelphia Orchestra, with Eugene Ormandy conducting. Some of his more recent solo appearances include appearances with the Mariposa Symphony Orchestra under the direction of maestro Les Marsden. Audiences in the central valley and the Yosemite Valley at the Ahwahnee Hotel enjoyed performances of the Dvorak Concerto and the Brahms Double Concerto, with the brilliant collaboration of Ann Miller, violinist. Mr. Lehn has previously been a part time member of the cello faculty of the Eastman School of Music in Rochester, New York, before his nine-year tenure as cellist in residence at the University of California, Santa Barbara. Since retiring from his position as ‘cellist in residence at University Of The Pacific he continues to teach privately at his home in Modesto.